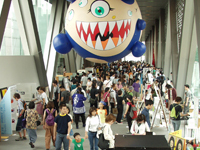 In the summer of 2001, “GEIJUTU DOJO Grand Prix” was conceived as a sub event of the Takashi Murakami solo exhibition “Summon Monsters? Open The Door? Heal? 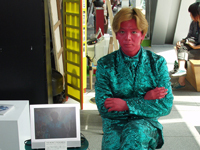 Or Die?”, and was held on September 2 at the Museum of Contemporary Art, Tokyo (MOT). 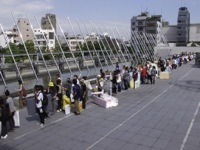 The day before the exhibition, there was an unbelievably long queue of exhibitors waiting to bring their artworks. The lobby of MOT was divided into individual booths for the exhibitors, who quickly set to work organizing their spaces. 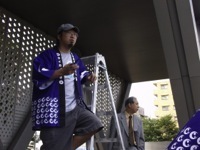 Chairman Takashi Murakami giving directions to staff members on site. Many exhibitors brought with them a portfolio to assist in their presentations. 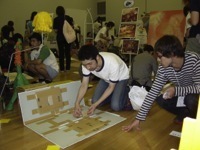 An exhibitor carefully assembles a small sculptural work. MOT’s lobby was filled with visitors. We communicated with each other by transceivers. Installation complete. 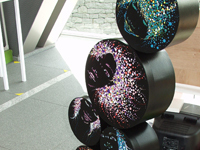 Here we see a rather gorgeous artwork employing glitter. 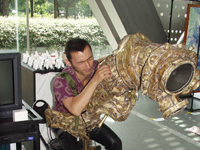 A sculpture that you can blow?! It was scratchable too. COPYRIGHT ©2013 GEISAI executive committee ALL RIGHTS RESERVED.